Seabourn Cruises will be the next cruise line to expand its reach to all seven continents when it begins sailing to Antarctica in November 2013. Seabourn Quest, the luxury cruise line’s newest ship, will sail four cruises, each 21 to 24 days, between Valparaiso, Chile, and Buenos Aires, Argentina. 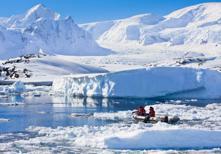 A highlight of each voyage will be a visit to the remote, vast and beautiful continent of Antarctica. While the ship is always an important consideration when selecting a cruise, when cruising to Antarctica it’s especially important. There are three basic types of ships that cruise to the icy waters of the White Continent – small, medium and large – and each provides a different Antarctic experience. Many of the small ships that sail to the Antarctic were originally icebreakers, specifically designed to break through large amounts of ice and sail into remote areas. These ships usually carry 100 to 200 passengers. Some have comfortable but basic accommodations, while others are quite luxurious. These ships can get close enough to the continent for passengers to board small, inflatable boats that allow them to land and actually set foot on Antarctica. However, be aware that opportunities for Antarctic landings are always dependent on the weather. Captains and their crews are experienced in assessing weather, ice and wildlife reports to determine when and where it’s safe to land. Medium-sized ships, like the Seabourn Quest, generally carry 200 to 500 passengers. They are often equipped with reinforced hulls; they can’t handle as much ice as an icebreaker, but they can often get close enough to the continent to launch inflatable boats or tenders. These ships usually offer more amenities than smaller ships, such as lounges, fitness centers and more expansive public spaces. Large ships carry up to 1,500 passengers to the waters off Antarctica. These ships provide more of the amenities cruise passengers are used to, such as entertainment venues and multiple dining spots. However, they can’t get close enough to the continent for passengers to safely tender to the shore – so, these cruises are for Antarctic sightseeing only. Still, the sightseeing can be spectacular, featuring immense icebergs, jagged snowy peaks, seals, penguins, whales and exotic sea birds such as albatross. Your Cruise Holidays personal cruise expert can provide more information on the different types of ships sailing to the Antarctic, as well as specific itineraries. A voyage to Antarctica can also provide the opportunity to explore the Falkland Islands, the Patagonia region of Argentina, the fjords of Chile and more. What's your dream destination? Find more great destination articles here.